Fluoride has both positive and negative effects on human health, similar to essential elements. Compared with many other chemicals, there is a relatively narrow range between intakes associated with beneficial effects and exposures causing adverse effects. The exposure to low levels of fluoride in drinking-water (i.e., approximately 1 mg/litre) has long been known to have a beneficial effect on the reduction of dental caries. Clinical use of fluoride in the treatment of osteoporosis (at doses generally greater than 25 mg/day) has been investigated in a number of studies. Based on the available data, it is evident that skeletal and dental effects related to fluoride exposure in humans occur at doses or intakes lower than those associated with other potential adverse tissue- or organ-specific effects. This is likely a consequence of the accumulation of fluoride almost exclusively in bones and teeth. In children, intakes of fluoride associated with beneficial effects on dentition overlap with those that lead to an increased prevalence of dental fluorosis. Consequently, public health programmes have sought to maximize the beneficial effects of fluoride on dental health, while at the same time minimizing its adverse fluorotic effects on the teeth. Effects on the skeleton are the most consistent and best characterized of the toxic responses to fluoride and are considered to have direct public health relevance. The skeletal changes that have been observed in a number of animal species (i.e., cattle, sheep, poultry, rodents) exposed to fluoride are not inconsistent with effects observed in humans, although data from such studies have not been utilized in the assessment of human exposure–response. 1 The effects of fluoride on dental health were reviewed in depth by WHO (1994), and therefore only a brief summary is presented here. of exposure–response for skeletal effects associated with exposure to fluoride. Information obtained from clinical studies, in which sodium fluoride was administered to patients for the treatment of osteoporosis, is inadequate, owing to the nature of the protocols, characteristics of the patients in these studies and inconsistencies in the results. Moreover, these clinical studies were undertaken to assess the considered beneficial effects of fluoride (i.e., its capacity to increase bone mass and decrease vertebral fractures), rather than its potential to produce adverse effects after long-term exposure. Estimating a putative effect level for the development of skeletal fluorosis (or related changes) in humans exposed to fluoride is further complicated by differences in the radiological diagnosis of early-stage skeletal fluorosis among health care professionals (Chan-Yeung et al., 1983a), as well as by the multiplicity of factors that may influence the amount of fluoride deposited in the bone, and hence the severity of the disease. In case accounts, the development of crippling skeletal fluorosis was attributed to an intake of approximately 230–310 μg fluoride/kg body weight per day in adults weighing 64 kg (US DHHS, 1991). Skeletal fluorosis has been observed in cryolite workers having estimated (occupational) intakes of approximately 310–1250 μg fluor- ide/kg body weight perday in adults weighing 64 kg (Grandjean,1982). lack of data on individual exposure in such studies, it is difficult to derive meaningful conclusions concerning the exposure–response relationship for possible skeletal effects associated with exposure to fluoride from these studies. Although the relative risk of hip, wrist or spinal fracture was increased in some groups of women residing in an elevated-fluoride community (with drinking-water containing 4 mg/litre, and having an estimated [mean]intake ofapproximately 72μg fluoride/kgbodyweight per day) compared with those in a control community (with drinking- water containing 1 mg fluoride/litre) (Sowers et al., 1986, 1991), the intake of fluoride by women in the elevated-fluoride community was likely underestimated (since it was derived solely from the amount of water-based beverages consumed), and the level of calcium in the drinking-water from the elevated-fluoride community was approximately 25% of the level in the control community. Other studies, including analytical investigations, have not identified an increased risk of skeletal fracture associated with the consumption of drinking-water containing elevated levels of fluoride (Madans et al., 1983; Simonen & Laitinen, 1985; Arnala et al., 1986; Jacobsen et al., 1993; Suarez-Almazor et al., 1993; Kröger et al., 1994; Cauley et al., 1995; Lehmann et al., 1998; Hillier et al., 2000). Only two analytical studies evaluated the risk of fracture across a range of fluoride exposures. Among 144 627 Finnish men and women, no association was observed between hip fractures and the well-water fluoride concentration, when allage groups were considered. However, in women 50–65 years of age at the start of follow-up, the relative risk of hip fracture increased with increasing well-water fluoride concentra- tions in the categories <0.1, 0.1–0.3, 0.3–0.5, 0.5–1.0, 1.1–1.5 and >1.5 mg/litre. The respective relative risk of hip fracture was 1.0, 1.16, 1.31, 1.53 (P < 0.05), 1.24 and 2.09 (P < 0.05) (Kurttio et al., 1999). Among 8266 Chinese men and women, the risk of all fractures and hip fractures was examined across a range of fluoride exposures (see Table 14 in chapter 8) (Li et al., 2001). There was an increased risk of overall fracture and hip fracture that became statistically significant at drinking-water levels in excess of 4.32 mg fluoride/litre. studies have attempted to address concerns related to the potential carcinogenicity of this substance. There has been no consistent evidence of an association between the consumption of fluoridated drinking-water and the incidence of, or mortality due to, cancer in a large number of ecological studies performed in many countries. Although these results do not support the hypothesis of an association, their considerable limitations preclude firm conclusions from being drawn regarding the carcinogenicity of fluoride in humans. For example, cancer of the bone was not assessed in the majority of these human ecological studies. Case control studies (Gelberg et al., 1995; Moss et al., 1995) have not identified a relationship between bone cancer and exposure to fluoride. The incidence of, or death due to, cancer has also been investigated in a number of historic cohort studies of workers exposed to fluoride predominantly in the aluminium smelting industry. 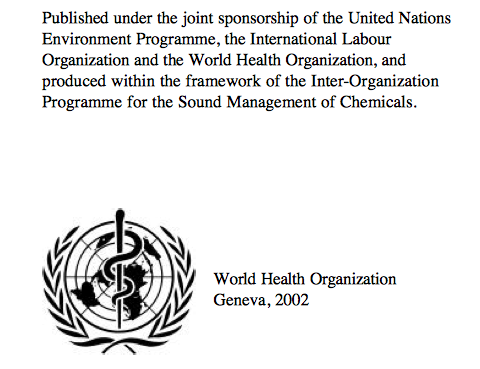 While excesses of cancers of different types have been reported in various studies, the only site for which there was excess risk in several investi- gations is lung cancer; due to confounding by concomitant exposure to known human carcinogens in analytical studies of occupationally exposed workers, the observed excesses cannot be attributed to fluoride exposure per se. Bone cancer was not assessed in the majority of these studies. Although the weight of evidence does not support the view that fluoride causes cancer in humans, the data on bone cancer are relatively limited. In early carcinogenicity bioassays conducted by Kanisawa & Schroeder (1969), Taylor (1954) and Tannenbaum & Silverstone (1949), the incidence of tumours in mice administered sodium fluoride (in either the diet or drinking-water) was, in general, not markedly greater than that observed in controls. Owing to inadequate documentation and to numerous methodological short comings, however, the results of these investigations do not contribute meaningfully to an assessment of the weight of evidence of the carcinogenicity of (sodium) fluoride. a period of 2 years produced a marginal (statistically insignificant) increase in the incidence of hepatoblastoma, compared with the incidence in groups of controls administered drinking-water with out added fluoride; however, this minor increase was not considered “biologically significant,” since the overall incidence of hepatic tumours (adenoma, carcinoma, hepatoblastoma) was not increased in animals receiving sodium fluoride, and the incidence of all hepatic tumours in these groups of mice was higher than that in previous NTP carcinogenicity bioassays (NTP, 1990). The marginal increase in the incidence of malignant lymphoma in female B6C3F1 mice administered drinking- water containing sodium fluoride was considered not to be compound- related, since the incidence in the high-dose group was similar to that observed in historical controls (NTP, 1990). No other increases in tumour incidence were observed; however, failure to attain the maxi- mumtolerated dose may have reduced somewhat the sensitivity of this study in mice. In a less extensive carcinogenicity bioassay in which the incidence of osteomas in male and female CD-1 mice receiving 11.3 mg fluoride/kg body weight per day in the diet was increased compared with controls (Maurer et al., 1993), the specific role of fluoride in the aetiology of the tumours cannot be determined with certainty,owing to the infection of these animals with Type C retrovirus (US DHHS, 1991; Maurer et al., 1993; US NRC, 1993).